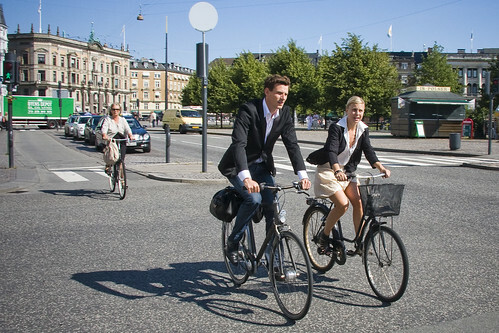 A pair of Copenhageners move through the intersection on the King's New Square. Sharply dressed for business, the bicycle provides them with a quick and effortless way to get about town. To meetings as well as to and from work. We're left wondering. Are they a couple or colleagues? The same applies to girlfriends cycling through the city. Are they heading for the beach or a café? Marketing Magazine just chose their Top 10 Hottest Fashion Websites. We're smiling like a Cheshire cat today. chatting with a friend is always best!! I love riding and chatting with my peeps. Congratulations, Mikael! Keep up the great work! love that first pic in particular. people here are obsessed with the idea of cycling clothes, will have to direct them to that pic!! Mikael, your blog is the only one on that Top 10 list that doesn't sell clothes. What a coup. Good on ya. Congratulations on making the Top 10 Hottest Fashion Websites! I love the site and check it the first thing every morning when I get to work. Keep up the good work. Congratulations Mikael, Lars and Velomama! You're on to something, but you knew that.